Product prices and availability are accurate as of 2019-04-20 21:41:35 UTC and are subject to change. Any price and availability information displayed on http://www.amazon.com/ at the time of purchase will apply to the purchase of this product. Sit comfortably on the water with the Ocean Kayak Comfort Zone kayak seat. The Comfort Zone offers generous back support with its tall height, perfect for a full day on the water. Enjoy a softer ride with the extra seat padding, which offers more cushioning than traditional kayak seats. 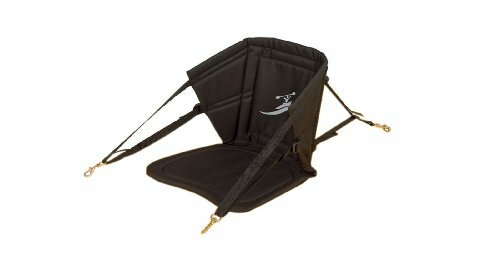 Adjustable straps on the sides allow the paddler to fine-tune the seat to a variety of comfort options. The tough nylon construction includes a built-in ventilation system to help keep any paddler cool and dry. Includes brass swivel buckles for attachment; Comfort Zone seats are featured on Ocean Kayak Trident Ultra kayaks. The Comfort Plus seat back offers couch-like comfort on the water. Extra foam padding provides the ultimate in comfort and support, while the four way adjustability provides a custom fit for almost any body type. It's made of durable UV-resistatn nylon pack cloth with reinforced stays for long-lasting usability. 4-way adjustability offers a custom fit for almost any body type. Other features include reflective logos that glow in the dark after exposure to sunlight and solid brass clips with stainless steel springs that clip easily to your kayak.